Hitfilm 3 Express review- the best free video editing software? FXHOME is in the video editing software development business since long. They have been developing paid software for video editing. But recently they have released a free version of Hitfilm 3 Pro called 'Hitfilm 3 Express'. Hitfilm 3 Express is a great tool to work with giving you complete control over your video. The interface of the software is kind of like Adobe Premiere Pro which is good because most of the video editors are familiar with it. One of the great features about this video editing software is that it has got video composition mode as well where you can add different effects to your video by using keyframes. If you want to get Hitfilm 3 Express you have to create an account in their official website and they will send you the link of the executable file to your email. But seriously there is no cost to pay for this amazing set of video editing and compositing tools. So, let's look at the features of this great tool. One of the most important feature that most of the advanced video editors need is keyframing. Keyframing is basically the ability to take control of every frame in the video and make changes to every single one of them. You can animate an image or a video using keyframing. You can apply different built in effects and apply keyframing to them to create almost anything you need for an indie video editor. One interesting feature that this video editing software has is that you can convert your contents to 3D on the go. This can help you to be even more creative with you video editing skills. You can even animate in 3D using the keyframing option. Most of the video editing software does not have the support of visual effects. Even the paid ones don't have both video editing and visual effects bundled in one single software. If you use Adobe Premiere Pro you have to use Adobe After Effects to integrate visual effects into your content. But surprisingly Hitfilm 3 Express provides both these capabilities as a free package. Although you cannot get better than After Effects, you can fulfill most of the needs. 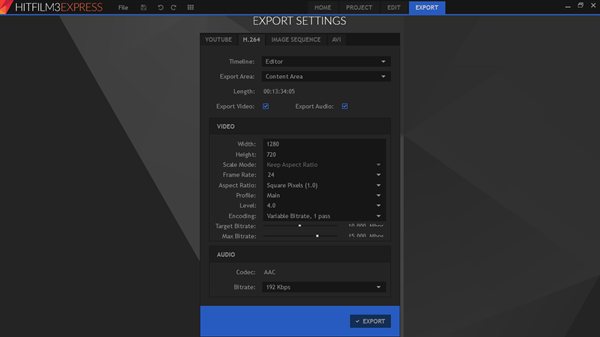 After you have finished editing your video you can upload your video directly to YouTube by optimizing the video settings on the export menu. To upload to YouTube you have to first of all add your account to Hitfilm. You can also add multiple YouTube accounts. This feature is pretty handy if you are editing your video only to post on YouTube. In Hitfilm 3 Express you have the freedom to create multiple tracks. This makes editing even more easier and manageable when you have lots of content. You can split the video at any point and work seamlessly. Most of the beginners may not have heard about image sequence. It is a set of images which are rendered using an animation software. These images when played one after the other at the correct frame rate you can see the animation. Image sequence has other benefits. But the point here is that you can import image sequence into Hitfilm 3 Express. When you import it into the software it becomes one file which you can drag to your timeline and work with it. There is also an option of exporting to image sequence. This is pretty cool. There is also option of creating titles for your video. So, you don't have to use any other software for completely editing and finishing your video. To conclude, Hitfilm 3 Express is the best video editing and compositing tool on the planet. So, if you are searching for a free video editing software don't think twice. So, what are you waiting for? Just go ahead to their official website and grab the software. You won't ever regret - after all it is free. Happy editing.